UNIT 6 THERMODYNAMICS After studying this Unit, you will be able to • explain the terms : system and surroundings; • discriminate between close, open and isolated systems; • explain internal energy, work and heat; • state first law of thermodynamics and express it mathematically; • calculate energy changes as work and heat contributions in chemical systems; • explain state functions: U, H. • correlate ΔU and ΔH; • measure experimentally ΔU and ΔH; • define standard states for ΔH; • calculate enthalpy changes for various types of reactions; • state and apply Hess’s law of constant heat summation; • differentiate between extensive and intensive properties; • define spontaneous and non-spontaneous processes; • explain entropy as a thermodynamic state function and apply it for spontaneity; • explain Gibbs energy change (ΔG); • establish relationship between ΔG and spontaneity, ΔG and equilibrium constant. It is the only physical theory of universal content concerning which I am convinced that, within the framework of the Albert Einstein Chemical energy stored by molecules can be released as heat during chemical reactions when a fuel like methane, cooking gas or coal burns in air. The chemical energy may also be used to do mechanical work when a fuel burns in an engine or to provide electrical energy through a galvanic cell like dry cell. Thus, various forms of energy are interrelated and under certain conditions, these may be transformed from one form into another. The study of these energy transformations forms the subject matter of thermodynamics. The laws of thermodynamics deal with energy changes of macroscopic systems involving a large number of molecules rather than microscopic systems containing a few molecules. Thermodynamics is not concerned about how and at what rate these energy transformations are carried out, but is based on initial and final states of a system undergoing the change. Laws of thermodynamics apply only when a system is in equilibrium or moves from one equilibrium state to another equilibrium state. Macroscopic properties like pressure and temperature do not change with time for a system in equilibrium state. In this unit, we would like to answer some of the important questions through thermodynamics, like: How do we determine the energy changes involved in a chemical reaction/process? Will it occur or not? What drives a chemical reaction/process? To what extent do the chemical reactions proceed? 6.1 THERMODYNAMIC TERMS We are interested in chemical reactions and the energy changes accompanying them. For this we need to know certain thermodynamic terms. These are discussed below. 6.1.1 The System and the Surroundings A system in thermodynamics refers to that part of universe in which observations are made and remaining universe constitutes the surroundings. The surroundings include everything other than the system. System and the surroundings together constitute the universe . The universe = The system + The surroundings However, the entire universe other than the system is not affected by the changes taking place in the system. Therefore, for all practical purposes, the surroundings are that portion of the remaining universe which can interact with the system. Usually, the region of space in the neighbourhood of the system constitutes its surroundings. For example, if we are studying the reaction between two substances A and B kept in a beaker, the beaker containing the reaction mixture is the system and the room where the beaker is kept is the surroundings (Fig. 6.1). Fig. 6.1 System and the surroundings Note that the system may be defined by physical boundaries, like beaker or test tube, or the system may simply be defined by a set of Cartesian coordinates specifying a particular volume in space. It is necessary to think of the system as separated from the surroundings by some sort of wall which may be real or imaginary. The wall that separates the system from the surroundings is called boundary. This is designed to allow us to control and keep track of all movements of matter and energy in or out of the system. 6.1.2 Types of the System We, further classify the systems according to the movements of matter and energy in or out of the system. 1. Open System In an open system, there is exchange of energy and matter between system and surroundings [Fig. 6.2 (a)]. The presence of reactants in an open beaker is an example of an open system*. Here the boundary is an imaginary surface enclosing the beaker and reactants. 2. Closed System In a closed system, there is no exchange of matter, but exchange of energy is possible between system and the surroundings [Fig. 6.2 (b)]. The presence of reactants in a closed vessel made of conducting material e.g., copper or steel is an example of a closed system. Fig. 6.2 Open, closed and isolated systems. * We could have chosen only the reactants as system then walls of the beakers will act as boundary. 3. Isolated System In an isolated system, there is no exchange of energy or matter between the system and the surroundings [Fig. 6.2 (c)]. The presence of reactants in a thermos flask or any other closed insulated vessel is an example of an isolated system. 6.1.3 The State of the System The system must be described in order to make any useful calculations by specifying quantitatively each of the properties such as its pressure (p), volume (V), and temperature (T ) as well as the composition of the system. We need to describe the system by specifying it before and after the change. You would recall from your Physics course that the state of a system in mechanics is completely specified at a given instant of time, by the position and velocity of each mass point of the system. In thermodynamics, a different and much simpler concept of the state of a system is introduced. It does not need detailed knowledge of motion of each particle because, we deal with average measurable properties of the system. We specify the state of the system by state functions or state variables. The state of a thermodynamic system is described by its measurable or macroscopic (bulk) properties. We can describe the state of a gas by quoting its pressure (p), volume (V), temperature (T ), amount (n) etc. Variables like p, V, T are called state variables or state functions because their values depend only on the state of the system and not on how it is reached. In order to completely define the state of a system it is not necessary to define all the properties of the system; as only a certain number of properties can be varied independently. This number depends on the nature of the system. Once these minimum number of macroscopic properties are fixed, others automatically have definite values. The state of the surroundings can never be completely specified; fortunately it is not necessary to do so. 6.1.4 The Internal Energy as a State Function When we talk about our chemical system losing or gaining energy, we need to introduce a quantity which represents the total energy of the system. It may be chemical, electrical, mechanical or any other type of energy you may think of, the sum of all these is the energy of the system. In thermodynamics, we call it the internal energy,U of the system, which may change, when • heat passes into or out of the system, • work is done on or by the system, • matter enters or leaves the system. These systems are classified accordingly as you have already studied in section 6.1.2. (a) Work Let us first examine a change in internal energy by doing work.We take a system containing some quantity of water in a thermos flask or in an insulated beaker. This would not allow exchange of heat between the system and surroundings through its boundary and we call this type of system as adiabatic. The manner in which the state of such a system may be changed will be called adiabatic process. Adiabatic process is a process in which there is no transfer of heat between the system and surroundings. Here, the wall separating the system and the surroundings is called the adiabatic wall (Fig 6.3). Fig. 6.3 An adiabatic system which does not permit the transfer of heat through its boundary. Let us bring the change in the internal energy of the system by doing some work on it. Let us call the initial state of the system as state A and its temperature as T . Let the A internal energy of the system in state A be calledU . We can change the state of the system Ain two different ways. One way: We do some mechanical work, say 1 kJ, by rotating a set of small paddles and thereby churning water. Let the new state be called B state and its temperature, as T . It is B found that TB > TA and the change in temperature, ΔT = T –T . Let the internal BA energy of the system in state B be UB and the change in internal energy, ΔU =U – U . BA Second way: We now do an equal amount (i.e., 1kJ) electrical work with the help of an immersion rod and note down the temperature change. We find that the change in temperature is same as in the earlier case, say, T – T . B A In fact, the experiments in the above manner were done by J. P. Joule between 1840–50 and he was able to show that a given amount of work done on the system, no matter how it was done (irrespective of path) produced the same change of state, as measured by the change in the temperature of the system. So, it seems appropriate to define a quantity, the internal energy U, whose value is characteristic of the state of a system, whereby the adiabatic work, wad required to bring about a change of state is equal to the difference between the value of U in one state and that in another state, ΔUi.e., ΔU = U − U =w 21 ad Therefore, internal energy, U, of the system is a state function. The positive sign expresses that wis ad positive when work is done on the system. Similarly, if the work is done by the system,wad will be negative. Can you name some other familiar state functions? Some of other familiar state functions are V, p, and T. For example, if we bring a change in temperature of the system from 25°C to 35°C, the change in temperature is 35°C–25°C = +10°C, whether we go straight up to 35°C or we cool the system for a few degrees, then take the system to the final temperature. Thus, T is a state function and 157 the change in temperature is independent of the route taken. Volume of water in a pond, for example, is a state function, because change in volume of its water is independent of the route by which water is filled in the pond, either by rain or by tubewell or by both, (b) Heat We can also change the internal energy of a system by transfer of heat from the surroundings to the system or vice-versa without expenditure of work. This exchange of energy, which is a result of temperature difference is called heat, q. Let us consider bringing about the same change in temperature (the same initial and final states as before in section 6.1.4 (a) by transfer of heat through thermally conducting walls instead of adiabatic walls (Fig. 6.4). Fig. 6.4 A system which allows heat transfer through its boundary. We take water at temperature, T in a Acontainer having thermally conducting walls, say made up of copper and enclose it in a huge heat reservoir at temperature, T . The heat B absorbed by the system (water), q can be measured in terms of temperature difference , T – T . In this case change in internal energy,BAΔU= q, when no work is done at constant volume. The q is positive, when heat is transferred from the surroundings to the system and q is negative when heat is transferred from system to the surroundings. (c) The general case Let us consider the general case in which a change of state is brought about both by doing work and by transfer of heat. We write change in internal energy for this case as: ΔU = q + w (6.1) For a given change in state, q and w can vary depending on how the change is carried out. However, q +w = ΔU will depend only on initial and final state. It will be independent of the way the change is carried out. If there is no transfer of energy as heat or as work (isolated system) i.e., if w = 0 and q = 0, then Δ U = 0. The equation 6.1 i.e., ΔU = q + w is mathematical statement of the first law of thermodynamics, which states that The energy of an isolated system is constant. It is commonly stated as the law of conservation of energy i.e., energy can neither be created nor be destroyed. Note: There is considerable difference between the character of the thermodynamic property energy and that of a mechanical property such as volume. We can specify an unambiguous (absolute) value for volume of a system in a particular state, but not the absolute value of the internal energy. However, we can measure only the changes in the internal energy, ΔU of the system. 6.2 APPLICATIONS Many chemical reactions involve the generation of gases capable of doing mechanical work or the generation of heat. It is important for us to quantify these changes and relate them to the changes in the internal energy. Let us see how! 6.2.1 Work First of all, let us concentrate on the nature of work a system can do. We will consider only mechanical work i.e., pressure-volume work. For understanding pressure-volume work, let us consider a cylinder which contains one mole of an ideal gas fitted with a frictionless piston. Total volume of the gas is V and pressure of the gas inside is p. If iexternal pressure is pex which is greater than p, piston is moved inward till the pressure inside becomes equal to pex. Let this change Fig. 6.5(a) Work done on an ideal gas in a cylinder when it is compressed by a constant external pressure, pex (in single step) is equal to the shaded area. be achieved in a single step and the final volume be Vf . During this compression, suppose piston moves a distance, l and is cross-sectional area of the piston is A [Fig. 6.5(a)]. then, volume change = l × A = ΔV = (V – V )f i force We also know, pressure = area Therefore, force on the piston = pex . A If w is the work done on the system by movement of the piston then w = force × distance = pex . A .l= p . (–ΔV) = – pΔV = – p(V – V ) (6.2)exex ex fi The negative sign of this expression is required to obtain conventional sign for w, which will be positive. It indicates that in case of compression work is done on the system. Here (V – V ) will be negative and negativefi multiplied by negative will be positive. Hence the sign obtained for the work will be positive. If the pressure is not constant at every stage of compression, but changes in number of finite steps, work done on the gas will be summed over all the steps and will be equal to −∑ pΔV [Fig. 6.5 (b)] If the pressure is not constant but changes during the process such that it is always infinitesimally greater than the pressure of the gas, then, at each stage of compression, the volume decreases by an infinitesimal amount, dV. In such a case we can calculate the work done on the gas by the relation V f w=− ∫ pex dV( 6.3) Vi Here, pat each stage is equal to (p + dp) inex incase of compression [Fig. 6.5(c)]. In an expansion process under similar conditions, the external pressure is always less than the pressure of the system i.e., pex = (pin– dp). In general case we can write, p = (p+ dp). Suchexin processes are called reversible processes. A process or change is said to be reversible, if a change is brought out in such a way that the process could, at any moment, be reversed by an infinitesimal change. A reversible process proceeds infinitely slowly by a series of equilibrium states such that system and the surroundings are always in near equilibrium with each other. Processes and changes in infinite steps (reversible conditions) during compression from initial volume, Vi to final volume, Vf . Work done on the gas is represented by the shaded area. other than reversible processes are known as irreversible processes. In chemistry, we face problems that can be solved if we relate the work term to the internal pressure of the system. We can relate work to internal pressure of the system under reversible conditions by writing equation 6.3 as follows: VVff wrev =− ∫ pex dV =− ∫ ( pin ± dp dV ) VVii Since dp × dV is very small we can write V f w = − ∫ p dVrev in (6.4) Vi Now, the pressure of the gas (pin which we can write as p now) can be expressed in terms of its volume through gas equation. For n mol of an ideal gas i.e., pV =nRT nRT⇒p = V Therefore, at constant temperature (isothermal process), VfdV Vf w =− nRT =− nRT ln rev ∫ VV Vii Vf = – 2.303 nRT log (6.5)Vi Free expansion: Expansion of a gas in vacuum (p = 0) is called free expansion. Noexwork is done during free expansion of an ideal gas whether the process is reversible or irreversible (equation 6.2 and 6.3). Now, we can write equation 6.1 in number of ways depending on the type of processes. Let us substitute w = – pex ΔV (eq. 6.2) in equation 6.1, and we get ΔU = q − p ΔV ex If a process is carried out at constant volume (ΔV = 0), then ΔU = qV the subscript V in qdenotes that heat is V supplied at constant volume. Isothermal and free expansion of an ideal gas For isothermal (T = constant) expansion of an ideal gas into vacuum ; w = 0 since pex = 0. Also, Joule determined experimentally that q = 0; therefore, ΔU = 0 Equation 6.1, Δ U = q+ w can be expressed for isothermal irreversible and reversible changes as follows: 1. For isothermal irreversible change q = – w = p(V – V )ex fi 2. For isothermal reversible change Vf q = – w = nRT ln Vi Vf = 2.303 nRT log Vi 3. For adiabatic change, q = 0, ΔU = wad 6.2.2 Enthalpy, H (a) A useful new state function We know that the heat absorbed at constant volume is equal to change in the internal energy i.e., ΔU = q. But most of chemical V reactions are carried out not at constant volume, but in flasks or test tubes under constant atmospheric pressure. We need to define another state function which may be suitable under these conditions. We may write equation (6.1) as ΔU = qp − pΔV at constant pressure, where q is heat absorbed by the system and –pΔV prepresent expansion work done by the system. Let us represent the initial state by subscript 1 and final state by 2 We can rewrite the above equation as U –U = q– p (V – V )21p 21On rearranging, we get q = (U + pV) – (U + pV) (6.6)p221 1Now we can define another thermodynamic function, the enthalpy H [Greek word enthalpien, to warm or heat content] as : H = U + pV (6.7) so, equation (6.6) becomes qp = H2 – H1 = ΔH Although q is a path dependent function, H is a state function because it depends on U, p and V, all of which are state functions. Therefore, ΔH is independent of path. Hence, qp is also independent of path. For finite changes at constant pressure, we can write equation 6.7 as ΔH = ΔU + ΔpV Since p is constant, we can write ΔH = ΔU + pΔV (6.8) It is important to note that when heat is absorbed by the system at constant pressure, we are actually measuring changes in the enthalpy. Remember ΔH = qp, heat absorbed by the system at constant pressure. ΔH is negative for exothermic reactions which evolve heat during the reaction and ΔH is positive for endothermic reactions which absorb heat from the surroundings. At constant volume (ΔV = 0), ΔU = q, therefore equation 6.8 becomes ΔH = ΔU = q V The difference between ΔH and ΔU is not usually significant for systems consisting of only solids and / or liquids. Solids and liquids do not suffer any significant volume changes upon heating. The difference, however, becomes significant when gases are involved. Let us consider a reaction involving gases. If VA is the total volume of the gaseous reactants, VB is the total volume of the gaseous products, n is the number of moles of gaseous reactantsAand n is the number of moles of gaseousBproducts, all at constant pressure and temperature, then using the ideal gas law, we write, pV = n RT AA and pVB = nBRT Thus, pV – pV = n RT – n RT = (n –n )RT g B A B A B A or p (VB – VA) = (nB – nA) RT or p ΔV = Δn RT (6.9) Here, Δng refers to the number of moles of gaseous products minus the number of moles of gaseous reactants. Substituting the value of pΔV from equation 6.9 in equation 6.8, we get ΔH = ΔU + Δn RT (6.10)g The equation 6.10 is useful for calculating ΔH from ΔU and vice versa. Problem 6.5 If water vapour is assumed to be a perfect gas, molar enthalpy change for vapourisation of 1 mol of water at 1bar and 100°C is 41kJ mol–1. Calculate the internal energy change, when (i) 1 mol of water is vaporised at 1 bar pressure and 100°C. (ii) 1 mol of water is converted into ice. Solution (i) The change H O (l )→ HO g 22 () ΔH =Δ U +Δ n RT g or ΔU = ΔH – Δn RT , substituting theg values, we get ΔU = 41.00 kJ mol −1 −1 −1 −1× 8.3 Jmol K × 373 K −1 −1 = 41.00 kJ mol − 3.096 kJ mol = 37.904 kJ mol–1 (ii) The change H O l → 2 ( s)2 () HO There is negligible change in volume, So, we can put pΔV =Δng RT≈ 0 in this case, ΔH ≅ΔU 1 so, ΔU = 41.00kJ mol− (b) Extensive and Intensive Properties In thermodynamics, a distinction is made between extensive properties and intensive properties. An extensive property is a property whose value depends on the quantity or size of matter present in the system. For example, mass, volume, internal energy, enthalpy, heat capacity, etc. are extensive properties. Those properties which do not depend on the quantity or size of matter present are known as intensive properties. For example temperature, density, pressure etc. are intensive properties. A molar property, χ m, is the value of an extensive property χ of the system for 1 mol of the substance. If n is the χ amount of matter, χ m = is independent of nthe amount of matter. Other examples are molar volume, V and molar heat capacity, C . m	m Let us understand the distinction between extensive and intensive properties by considering a gas enclosed in a container of volume V and at temperature T [Fig. 6.6(a)]. Let us make a partition such that volume is halved, each part [Fig. 6.6 (b)] now has one V half of the original volume, , but the2 temperature will still remain the same i.e., T. It is clear that volume is an extensive property and temperature is an intensive property. Fig. 6.6(a) A gas at volume V and temperature T (c) Heat Capacity In this sub-section, let us see how to measure heat transferred to a system. This heat appears as a rise in temperature of the system in case of heat absorbed by the system. The increase of temperature is proportional to the heat transferred q = coeff ×Δ T The magnitude of the coefficient depends on the size, composition and nature of the system. We can also write it as q = C ΔT The coefficient, Cis called the heat capacity. Thus, we can measure the heat supplied by monitoring the temperature rise, provided we know the heat capacity. When C is large, a given amount of heat results in only a small temperature rise. Water has a large heat capacity i.e., a lot of energy is needed to raise its temperature. C is directly proportional to amount of substance. The molar heat capacity of a ⎛C ⎞ =substance, Cm ⎜⎟ , is the heat capacity for⎝ n ⎠ one mole of the substance and is the quantity of heat needed to raise the temperature of one mole by one degree celsius (or one kelvin). Specific heat, also called specific heat capacity is the quantity of heat required to raise the temperature of one unit mass of a substance by one degree celsius (or one kelvin). For finding out the heat, q, required to raise the temperatures of a sample, we multiply the specific heat of the substance, c, by the mass m, and temperatures change, ΔT as q = c ×m ×ΔT = C ΔT	(6.11) (d) The relationship between Cp and CV for an ideal gas At constant volume, the heat capacity, C is denoted by CV and at constant pressure, this is denoted by C . Let us find the relationshipp between the two. We can write equation for heat, q at constant volume as qV = CV ΔT =ΔU at constant pressure as q= Cp ΔT =ΔH p The difference between C and C can be pVderived for an ideal gas as: For a mole of an ideal gas, ΔH = ΔU + Δ(pV )= ΔU + Δ(RT )= ΔU + RΔT ∴ΔH =ΔU + R ΔT	(6.12) On putting the values of ΔH and ΔU, we have Cp ΔT = CV ΔT + RΔT C = C + R p	V Cp −CV = R (6.13) 6.3 MEASUREMENT OF ΔU AND ΔH: CALORIMETRY We can measure energy changes associated with chemical or physical processes by an experimental technique called calorimetry. In calorimetry, the process is carried out in a vessel called calorimeter, which is immersed in a known volume of a liquid. Knowing the163 heat capacity of the liquid in which calorimeter is immersed and the heat capacity of calorimeter, it is possible to determine the heat evolved in the process by measuring temperature changes. Measurements are made under two different conditions: i) at constant volume, qV ii) at constant pressure, qp (a) ΔU measurements For chemical reactions, heat absorbed at constant volume, is measured in a bomb calorimeter (Fig. 6.7). Here, a steel vessel (the bomb) is immersed in a water bath. The whole device is called calorimeter. The steel vessel is immersed in water bath to ensure that no heat is lost to the surroundings. A combustible substance is burnt in pure dioxygen supplied in the steel bomb. Heat evolved during the reaction is transferred to the water around the bomb and its temperature is monitored. Since the bomb calorimeter is sealed, its volume does not change i.e., the energy changes associated with reactions are measured at constant volume. Under these conditions, no work is Fig. 6.7 Bomb calorimeter done as the reaction is carried out at constant volume in the bomb calorimeter. Even for reactions involving gases, there is no work done as ΔV = 0. Temperature change of the calorimeter produced by the completed reaction is then converted to q, by using theVknown heat capacity of the calorimeter with the help of equation 6.11. (b) ΔH measurements Measurement of heat change at constant pressure (generally under atmospheric pressure) can be done in a calorimeter shown in Fig. 6.8. We know that ΔH = qp (at constant p) and, therefore, heat absorbed or evolved, q at constant pressure is also calledpthe heat of reaction or enthalpy of reaction,Δ H. r In an exothermic reaction, heat is evolved, and system loses heat to the surroundings. Therefore, qp will be negative and Δ rH will also be negative. Similarly in an endothermic reaction, heat is absorbed, qp is positive and Δ H will be positive.r at constant pressure (atmospheric pressure). Problem 6.6 1g of graphite is burnt in a bomb calorimeter in excess of oxygen at 298 K and 1 atmospheric pressure according to the equation C (graphite) + O2 (g) → CO2 (g) During the reaction, temperature rises from 298 K to 299 K. If the heat capacity of the bomb calorimeter is 20.7kJ/K, what is the enthalpy change for the above reaction at 298 K and 1 atm? Solution Suppose q is the quantity of heat from the reaction mixture and C is the heat Vcapacity of the calorimeter, then the quantity of heat absorbed by the calorimeter. q = C × ΔT V Quantity of heat from the reaction will have the same magnitude but opposite sign because the heat lost by the system (reaction mixture) is equal to the heat gained by the calorimeter. q =− CV ×ΔT =− 20.7 kJ/K × (299 − 298)K =− 20.7 kJ (Here, negative sign indicates the exothermic nature of the reaction) Thus, ΔU for the combustion of the 1g of graphite = – 20.7 kJK–1 For combustion of 1 mol of graphite, 12.0 g mol−1 × (−20.7kJ) = 1g = – 2.48 ×102 kJ mol–1 , Since Δ ng = 0, Δ H = Δ U = – 2.48 ×102 kJ mol–1 6.4 ENTHALPY CHANGE, Δ rH OF A REACTION – REACTION ENTHALPY In a chemical reaction, reactants are converted into products and is represented by, Reactants → Products The enthalpy change accompanying a reaction is called the reaction enthalpy. The enthalpy change of a chemical reaction, is given by the symbol Δ H r Δ H = (sum of enthalpies of products) – (sumr of enthalpies of reactants) = aH − bH∑ i products ∑i reactants (6.14)ii (Here symbol ∑ (sigma) is used for summation and a and b are the stoichiometric iicoefficients of the products and reactants respectively in the balanced chemical equation. For example, for the reaction CH (g) + 2O (g) → CO (g) + 2HO (l)422 2Δ rH =∑aiH products −∑biHreactants ii = [H (CO,g) + 2H (HO, l)]– [H (CH , g)m2 m2m4+ 2H (O, g)]m 2where H is the molar enthalpy.mEnthalpy change is a very useful quantity. Knowledge of this quantity is required when one needs to plan the heating or cooling required to maintain an industrial chemical reaction at constant temperature. It is also required to calculate temperature dependence of equilibrium constant. (a) Standard enthalpy of reactions Enthalpy of a reaction depends on the conditions under which a reaction is carried out. It is, therefore, necessary that we must specify some standard conditions. The standard enthalpy of reaction is the enthalpy change for a reaction when all the participating substances are in their standard states. The standard state of a substance at a specified temperature is its pure form at 1 bar. For example, the standard state of liquid ethanol at 298 K is pure liquid ethanol at 1 bar; standard state of solid iron at 500 K is pure iron at 1 bar. Usually data are taken at 298 K. Standard conditions are denoted by adding the superscriptV to the symbolΔH, e.g., ΔHV (b) Enthalpy changes during phase transformations Phase transformations also involve energy changes. Ice, for example, requires heat for melting. Normally this melting takes place at constant pressure (atmospheric pressure) and during phase change, temperature remains constant (at 273 K). V −1H O(s) → H O( );l Δ H = 6.00 kJ mol22 fus Here ΔfusH0 is enthalpy of fusion in standard state. If water freezes, then process is reversed and equal amount of heat is given off to the surroundings. The enthalpy change that accompanies melting of one mole of a solid substance in standard state is called standard enthalpy of fusion or molar enthalpy of fusion, ΔfusH0 . Melting of a solid is endothermic, so all enthalpies of fusion are positive. Water requires heat for evaporation. At constant temperature of its boiling pointTb and at constant pressure: HO( ) → H O(g); Δ HV =+ 40.79kJ mol−1l22 vap Δ H0 is the standard enthalpy of vaporization.vap Amount of heat required to vaporize one mole of a liquid at constant temperature and under standard pressure (1bar) is called its standard enthalpy of vaporization or molar enthalpy of H0 vaporization, Δ . vap Sublimation is direct conversion of a solid into its vapour. Solid CO2 or ‘dry ice’ sublimes at 195K with Δ H 0=25.2 kJ mol–1;sub naphthalene sublimes slowly and for this V −1Δ subH = 73.0 kJ mol . Standard enthalpy of sublimation, ΔsubH 0 is the change in enthalpy when one mole of a solid substance sublimes at a constant temperature and under standard pressure (1bar). The magnitude of the enthalpy change depends on the strength of the intermolecular interactions in the substance undergoing the phase transfomations. For example, the strong hydrogen bonds between water molecules hold them tightly in liquid phase. For an organic liquid, such as acetone, the intermolecular (T and T are melting and boiling points, respectively)fbdipole-dipole interactions are significantly weaker. Thus, it requires less heat to vaporise 1 mol of acetone than it does to vaporize 1 mol of water. Table 6.1 gives values of standard enthalpy changes of fusion and vaporisation for some substances. (c) Standard enthalpy of formation The standard enthalpy change for the formation of one mole of a compound from its elements in their most stable states of aggregation (also known as reference states) is called Standard Molar Enthalpy of Formation. Its symbol is ΔfH 0, where the subscript ‘ f ’ indicates that one mole of the compound in question has been formed in its standard state from its elements in their most stable states of aggregation. The reference state of an element is its most stable state of aggregation at 25°C and 1 bar pressure. For example, the reference state of dihydrogen is H gas and those of dioxygen, carbon and2sulphur are O gas, C and S2graphiterhombic respectively. Some reactions with standard molar enthalpies of formation are given below. H (g) + ½O (g) → H O(1);2 22 1Δ fHV =−285.8 kJ mol− C (graphite, s) +2H (g)2 CH (g);→ 4 f Few Selected Substances V −1Δ fH =−74.81kJmol ( )+ 3H (g)+ ½O (g) → C H OH(1);2C graphite,s 2 225 V −1Δ fH =−277.7kJ mol It is important to understand that a standard molar enthalpy of formation, ΔfH0 , is just a special case of Δ H0, where one mole r of a compound is formed from its constituent elements, as in the above three equations, where 1 mol of each, water, methane and ethanol is formed. In contrast, the enthalpy change for an exothermic reaction: CaO(s) + CO (g) → CaCO (s);23 HVΔ =−178.3kJ mol−1 r is not an enthalpy of formation of calcium carbonate, since calcium carbonate has been formed from other compounds, and not from its constituent elements. Also, for the reaction given below, enthalpy change is not standard enthalpy of formation, ΔfH 0 for HBr(g). H (g) + Br( )l → 2HBr(g);22 V −1Δ H =−72.8 kJmol r Here two moles, instead of one mole of the product is formed from the elements, i.e., Δ rHV = 2Δ fHV . Therefore, by dividing all coefficients in the balanced equation by 2, expression for enthalpy of formation of HBr (g) is written as ½H (g) + ½Br (1) → HBr(g); 22 V −1Δ fH =−36.4 kJ mol Standard enthalpies of formation of some common substances are given in Table 6.2. By convention, standard enthalpy for formation, ΔfH 0, of an element in reference state, i.e., its most stable state of aggregation is taken as zero. Suppose, you are a chemical engineer and want to know how much heat is required to decompose calcium carbonate to lime and carbon dioxide, with all the substances in their standard state. CaCO (s) → CaO(s) + CO (g); Δ H V = ?3	2 r Here, we can make use of standard enthalpy of formation and calculate the enthalpy change for the reaction. The following general equation can be used for the enthalpy change calculation. VV VΔrH =∑ai ΔfH (products )−∑bi ΔfH ( reactants ) ii (6.15) where a and b represent the coefficients of the products and reactants in the balanced equation. Let us apply the above equation for decomposition of calcium carbonate. Here, coefficients ‘a’ and ‘b’ are 1 each. Therefore, VV VΔ H =Δ H [CaO(s)] +Δ H [CO (g)] rf f 2 −Δ HV [CaCO (s)] f 3 −1 −1=1( −635.1 kJ mol )+1( −393.5 kJ mol ) −1( 1206.9 kJ mol −	−1) = 178.3 kJ mol–1 Thus, the decomposition of CaCO (s) is an3endothermic process and you have to heat it for getting the desired products. (d) Thermochemical equations A balanced chemical equation together with the value of itsΔ H is called a thermochemical r equation. We specify the physical state (alongwith allotropic state) of the substance in an equation. For example: CH OH() l + 3O (g) → 2CO (g) + 3H O(): l25 222 V −1Δ H =− 1367 kJ mol r The above equation describes the combustion of liquid ethanol at constant temperature and pressure. The negative sign of enthalpy change indicates that this is an exothermic reaction. It would be necessary to remember the following conventions regarding thermo-chemical equations. 1. The coefficients in a balanced thermo-chemical equation refer to the number of moles (never molecules) of reactants and products involved in the reaction. 2. The numerical value of Δ H 0 refers to the r number of moles of substances specified by an equation. Standard enthalpy change Δ H 0 will have units as kJ mol–1. r To illustrate the concept, let us consider the calculation of heat of reaction for the following reaction : (s)+ 3H ( g)→ 2Fe s + 3HO l, ()Fe O ()232 2 From the Table (6.2) of standard enthalpy of formation (Δf H 0), we find : Δ H VH O, lf ( 2) = –285.83 kJ mol–1; VΔ H ( FeO ,s ) = – 824.2 kJ mol–1;f 23 Also Δ fH V(Fe,s) =0 and Δ fH V (H 2,g) =0asperconvention Then, ΔrH 1 V = 3(–285.83 kJ mol–1)– 1(– 824.2 kJ mol–1) = (–857.5 + 824.2) kJ mol–1 = –33.3 kJ mol–1 Note that the coefficients used in these calculations are pure numbers, which are equal to the respective stoichiometric coefficients. The unit for Δ H 0 is r kJ mol–1, which means per mole of reaction. Once we balance the chemical equation in a particular way, as above, this defines the mole of reaction. If we had balanced the equation differently, for example, 13 3( ) + H ( ) → Fe s + HO l () FeO s g () 232 2 22 2 then this amount of reaction would be one mole of reaction and Δ H 0 would be r 3V −Δ H2= (− 285.83 kJmol 1 )r 2 1	1 )−− (−824.2kJmol 2 = (– 428.7 + 412.1) kJ mol–1 = –16.6 kJ mol–1 = ½ Δ rH 1 V It shows that enthalpy is an extensive quantity. 3. When a chemical equation is reversed, the H 0value of Δ r is reversed in sign. For example N (g) + 3H g → 2NH (g); 22 () 3 V −1Δ H =− 91.8kJ mol r 2NH (g) → N (g) + 3H (g); 322 V −1Δ H =+ 91.8kJ mol r (e) Hess’s Law of Constant Heat Summation We know that enthalpy is a state function, therefore the change in enthalpy is independent of the path between initial state (reactants) and final state (products). In other words, enthalpy change for a reaction is the same whether it occurs in one step or in a series of steps. This may be stated as follows in the form of Hess’s Law. If a reaction takes place in several steps then its standard reaction enthalpy is the sum of the standard enthalpies of the intermediate reactions into which the overall reaction may be divided at the same temperature. Let us understand the importance of this law with the help of an example. Consider the enthalpy change for the reaction C graphite,s ( )+ 1 2g ( ) Δ r V ?O ( ) → COg ; H = 2 Although CO(g) is the major product, some CO gas is always produced in this reaction.2Therefore, we cannot measure enthalpy change for the above reaction directly. However, if we can find some other reactions involving related species, it is possible to calculate the enthalpy change for the above reaction. Let us consider the following reactions: C graphite,s + O2 g → CO g; V −1 (i) ( )() 2 () ΔrH =− 393.5 kJmol 1 CO g ( ) + O2 ( ) → CO 2 g; g () 2 (ii)V −1Δ H =−283.0kJmol r We can combine the above two reactions in such a way so as to obtain the desired reaction. To get one mole of CO(g) on the right, we reverse equation (ii). In this, heat is absorbed instead of being released, so we change sign of Δ H 0 value r 1 2 COg 2 () CO () g → () + O g; 2 Δ rHV =+283.0 kJmol −1 (iii) Adding equation (i) and (iii), we get the desired equation, 1( )+ Og → COg ; () C graphite,s 2 () 2 for which Δ HV = (−393.5 + 283.0 )r = – 110.5 kJ mol–1 In general, if enthalpy of an overall reaction A→B along one route is Δ rH and Δ rH1, Δ rH2, Δ H ..... representing enthalpies of reactionsr 3leading to same product, B along another route,then we have Δ rH = Δ rH1 + Δ rH2 + Δ rH3 ... (6.16) It can be represented as: Δ H A r B Δ HΔ rH1 r 3 C Δ rH2 D 6.5 ENTHALPIES FOR DIFFERENT TYPES OF REACTIONS It is convenient to give name to enthalpies specifying the types of reactions. (a) Standard enthalpy of combustion (symbol : Δ H0)c Combustion reactions are exothermic in nature. These are important in industry, rocketry, and other walks of life. Standard enthalpy of combustion is defined as the enthalpy change per mole (or per unit amount) of a substance, when it undergoes combustion and all the reactants and products being in their standard states at the specified temperature. Cooking gas in cylinders contains mostly butane (C4H10). During complete combustion of one mole of butane, 2658 kJ of heat is released. We can write the thermochemical reactions for this as: C H (g) + 13 O (g) → 4CO (g) + 5H O(1);410 2 222 V −1ΔcH =−2658.0 kJ mol Similarly, combustion of glucose gives out 2802.0 kJ/mol of heat, for which the overall equation is : 6 12O (g) + 6O (g)2 → 6CO (g) + 6H O(1);2CH 6 2 V −1Δ H =−2802.0 kJ mol c Our body also generates energy from food by the same overall process as combustion, although the final products are produced after a series of complex bio-chemical reactions involving enzymes. -H VΔ f =−3218.49 kJ mol 1 ... (v ) Reversing equation (ii); 15 6CO ( ) + () → CH ()l + O;g 3HOl2266 2 2 V -1Δ fH = 3267.0 kJ mol ... ( vi) Adding equations (v) and (vi), we get 6C graphite + 3H g → CH l;() 2 () 66 () Δ fH V = 48.51 kJ mol -1 (b) Enthalpy of atomization (symbol: Δ H0)a Consider the following example of atomization of dihydrogen H2(g) → 2H(g); Δ aH0 = 435.0 kJ mol–1 You can see that H atoms are formed by breaking H–H bonds in dihydrogen. The enthalpy change in this process is known as enthalpy of atomization, Δ H 0 . It is the a enthalpy change on breaking one mole of bonds completely to obtain atoms in the gas phase. In case of diatomic molecules, like dihydrogen (given above), the enthalpy of atomization is also the bond dissociation enthalpy. The other examples of enthalpy of atomization can be CH4(g) → C(g) + 4H(g); Δ aH 0 = 1665 kJ mol–1 Note that the products are only atoms of C and H in gaseous phase. Now see the following reaction: Na(s) → Na(g) ; Δ H 0 = 108.4 kJ mol–1 a In this case, the enthalpy of atomization is same as the enthalpy of sublimation. (c) Bond Enthalpy (symbol: Δ H0)bond Chemical reactions involve the breaking and making of chemical bonds. Energy is required to break a bond and energy is released when a bond is formed. It is possible to relate heat of reaction to changes in energy associated with breaking and making of chemical bonds. With reference to the enthalpy changes associated with chemical bonds, two different terms are used in thermodynamics. (i) Bond dissociation enthalpy (ii) Mean bond enthalpy Let us discuss these terms with reference to diatomic and polyatomic molecules. Diatomic Molecules: Consider the following process in which the bonds in one mole of dihydrogen gas (H) are broken:2(g) → 2H(g) ; ΔH 0 = 435.0 kJ mol–1H2H–HThe enthalpy change involved in this process is the bond dissociation enthalpy of H–H bond. The bond dissociation enthalpy is the change in enthalpy when one mole of covalent bonds of a gaseous covalent compound is broken to form products in the gas phase. Note that it is the same as the enthalpy of atomization of dihydrogen. This is true for all diatomic molecules. For example: Cl2(g) → 2Cl(g) ; ΔH 0 = 242 kJ mol–1 Cl–ClO2(g) → 2O(g) ; ΔO=OH 0 = 428 kJ mol–1 In the case of polyatomic molecules, bond dissociation enthalpy is different for different bonds within the same molecule. Polyatomic Molecules: Let us now consider a polyatomic molecule like methane, CH4. The overall thermochemical equation for its atomization reaction is given below: CH (g) → C(g) + 4H(g);4 V −1Δ H = 1665 kJ mol a In methane, all the four C – H bonds are identical in bond length and energy. However, the energies required to break the individual C – H bonds in each successive step differ : HV 1CH (g) →CH (g)+ H(g);Δ =+427 kJ mol− 43 bondHV 1CH (g) → CH (g)+ H(g);Δ =+439kJ mol− 32 bond HV 1CH (g) → CH(g)+ H(g); Δ =+452kJ mol− 2bond HV 1CH(g) → C(g)+ H(g);Δbond =+347kJ mol− Therefore, V −1CH (g) → C(g) + 4H(g);Δ H = 1665kJ mol4a In such cases we use mean bond enthalpy of C – H bond. 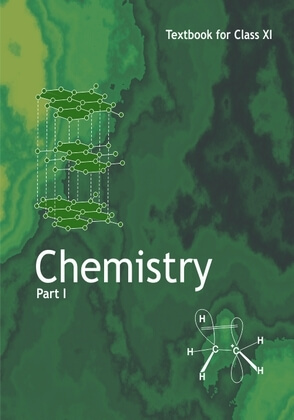 For example in CH4, ΔC–HH 0 is calculated as: VV	−1Δ H = ¼(Δ H ) = ¼ (1665kJ mol )C−H a = 416 kJ mol–1 We find that mean C–H bond enthalpy in methane is 416 kJ/mol. It has been found that mean C–H bond enthalpies differ slightly from compound to compound, as in CH CH Cl,CH NO3 , etc, but it does not differ32 2 in a great deal*. Using Hess’s law, bond enthalpies can be calculated. Bond enthalpy values of some single and multiple bonds are given in Table 6.3. The reaction enthalpies are very important quantities as these arise from the changes that accompany the breaking of old bonds and formation of the new bonds. We can predict enthalpy of a reaction in gas phase, if we know different bond enthalpies. The standard enthalpy of reaction, Δ H0 is related r to bond enthalpies of the reactants and products in gas phase reactions as: ΔrHV =∑ bond enthalpiesreactants −∑ bond enthalpies products (6.17)** This relationship is particularly more useful when the required values of Δf areH0not available. The net enthalpy change of a reaction is the amount of energy required to break all the bonds in the reactant molecules minus the amount of energy required to break all the bonds in the product molecules. Remember that this relationship is approximate and is valid when all substances (reactants and products) in the reaction are in gaseous state. H0 (d) Enthalpy of Solution (symbol : Δsol) Enthalpy of solution of a substance is the enthalpy change when one mole of it dissolves –1Table 6.3(a) Some Mean Single Bond Enthalpies in kJ mol at 298 K H CN OF SiP SCl BrI 435.8 414 389 464 569 293 318 339 431 368 297 H 347 293 351 439 289 264 259 330 276 238 C 159 201272 -209 -201 243 -N 138184 368 351 -205 -201 O 155 540 490 327 255 197 -F 176 213 226 360 289 213 Si 213 230 331 272 213 P 213251 213 -S 243 218 209 Cl 192 180 Br 151 I –1Table 6.3(b) Some Mean Multiple Bond Enthalpies in kJ mol at 298 K N = N 418 C = C 611 O = O 498 N ≡ N 946 C ≡ C 837 C = N 615 C = O 741 C ≡ N 891 C ≡ O 1070 * Note that symbol used for bond dissociation enthalpy and mean bond enthalpy is the same. 0**If we use enthalpy of bond formation, (ΔH ), which is the enthalpy change when one mole of a particular type off bondV	V Vbond is formed from gaseous atom, then Δ rH =∑Δ f Hbondsof products −∑Δ f Hbondsof reactants in a specified amount of solvent. The enthalpy of solution at infinite dilution is the enthalpy change observed on dissolving the substance in an infinite amount of solvent when the interactions between the ions (or solute molecules) are negligible. When an ionic compound dissolves in a solvent, the ions leave their ordered positions on the crystal lattice. These are now more free in solution. But solvation of these ions (hydration in case solvent is water) also occurs at the same time. This is shown diagrammatically, for an ionic compound, AB (s) The enthalpy of solution of AB(s), Δ H0, insol water is, therefore, determined by the selective values of the lattice enthalpy,Δ H0 and lattice enthalpy of hydration of ions, Δ H0 as hyd V VVΔ H = Δ H +Δ Hsol lattice hyd For most of the ionic compounds, Δ H0 is sol positive and the dissociation process is endothermic. Therefore the solubility of most salts in water increases with rise of temperature. If the lattice enthalpy is very high, the dissolution of the compound may not take place at all. Why do many fluorides tend to be less soluble than the corresponding chlorides? Estimates of the magnitudes of enthalpy changes may be made by using tables of bond energies (enthalpies) and lattice energies (enthalpies). Lattice Enthalpy The lattice enthalpy of an ionic compound is the enthalpy change which occurs when one mole of an ionic compound dissociates into its ions in gaseous state. +− +−Na Cl (s)→ Na (g) + Cl ()g; Δ HV =+788 kJmol −1 lattice Since it is impossible to determine lattice enthalpies directly by experiment, we use an indirect method where we construct an enthalpy diagram called a Born-Haber Cycle (Fig. 6.9). Let us now calculate the lattice enthalpy of Na+Cl–(s) by following steps given below : 1. Na(s) → Na(g) , sublimation of sodium metal, ΔsubHV = 108.4 kJ mol−1 +−12. Na(g) → Na (g) + e (g) , the ionization of sodium atoms, ionization enthalpy Δ H0 = 496 kJ mol–1 i 3.1 2 → Cl(g) Cl(g) , the dissociation of 2 chlorine, the reaction enthalpy is half the bond dissociation enthalpy. 1 V −1ΔbondH= 121kJ mol . 2 4. Cl(g) + e −1(g) → Cl(g) electron gained by chlorine atoms. The electron gain enthalpy, Δ H 0 = –348.6 kJ mol–1. eg You have learnt about ionization enthalpy and electron gain enthalpy in Unit 3. In fact, these terms have been taken from thermodynamics. Earlier terms, ionization energy and electron affinity were in practice in place of the above terms (see the box for justification). Ionization Energy and Electron Affinity Ionization energy and electron affinity are defined at absolute zero. At any other temperature, heat capacities for the reactants and the products have to be taken into account. Enthalpies of reactions for M(g) → M+(g) + e– (for ionization) M(g) + e– → M–(g) (for electron gain) at temperature, T is T ∫Δ CV dTΔ rH0(T ) = Δ rH 0(0) + rp 0 The value of Cp for each species in the above reaction is 5/2 R (CV = 3/2R) So, Δ rCp 0 = + 5/2 R (for ionization) Δ rCp 0 = – 5/2 R (for electron gain) Therefore, Δ rH0 (ionization enthalpy)= E0 (ionization energy) + 5/2 RT Δ rH0 (electron gain enthalpy)= – A( electron affinity) – 5/2 RT +− +−5. Na (g) + Cl (g) → Na Cl (s) The sequence of steps is shown in Fig. 6.9, and is known as a Born-Haber cycle. The importance of the cycle is that, the sum of the enthalpy changes round a cycle is zero. Applying Hess’s law, we get, HVΔ= 411.2 +108.4 +121 + 496 − 348.6 latticeΔ HV =+788 kJ lattice +−for NaCl(s) → Na (g) + Cl (g) Internal energy is smaller by 2RT ( because Δn = 2) and is equal to + 783 kJ mol–1. gNow we use the value of lattice enthalpy to calculate enthalpy of solution from the expression: V VVΔ H =Δ H +Δ Hsol lattice hyd For one mole of NaCl(s), lattice enthalpy = + 788 kJ mol–1 and Δ H 0 = – 784 kJ mol–1( from thehyd literature) Δ H 0 = + 788 kJ mol–1 – 784 kJ mol–1sol = + 4 kJ mol–1 The dissolution of NaCl(s) is accompanied by very little heat change. 6.6 SPONTANEITY The first law of thermodynamics tells us about the relationship between the heat absorbed and the work performed on or by a system. It puts no restrictions on the direction of heat flow. However, the flow of heat is unidirectional from higher temperature to lower temperature. In fact, all naturally occurring processes whether chemical or physical will tend to proceed spontaneously in one direction only. For example, a gas expanding to fill the available volume, burning carbon in dioxygen giving carbon dioxide. But heat will not flow from colder body to warmer body on its own, the gas in a container will not spontaneously contract into one corner or carbon dioxide will not form carbon and dioxygen spontaneously. These and many other spontaneously occurring changes show unidirectional change. We may ask ‘what is the driving force of spontaneously occurring changes ? What determines the direction of a spontaneous change ? In this section, we shall establish some criterion for these processes whether these will take place or not. Let us first understand what do we mean by spontaneous reaction or change ? You may think by your common observation that spontaneous reaction is one which occurs immediately when contact is made between the reactants. Take the case of combination of hydrogen and oxygen. These gases may be mixed at room temperature and left for many years without observing any perceptible change. Although the reaction is taking place between them, it is at an extremely slow rate. It is still called spontaneous reaction. So spontaneity means ‘having the potential to proceed without the assistance of external agency’. However, it does not tell about the rate of the reaction or process. Another aspect of spontaneous reaction or process, as we see is that these cannot reverse their direction on their own. We may summarise it as follows: A spontaneous process is an irreversible process and may only be reversed by some external agency. (a) Is decrease in enthalpy a criterion for spontaneity ? If we examine the phenomenon like flow of water down hill or fall of a stone on to the ground, we find that there is a net decrease in potential energy in the direction of change. By analogy, we may be tempted to state that a chemical reaction is spontaneous in a given direction, because decrease in energy has taken place, as in the case of exothermic reactions. For example: 13 N(g) + H(g) = NH(g) ;22232 H0Δ = – 46.1 kJ mol–1 r 11 H2(g) + Cl2(g) = HCl (g) ;22 Δ H0 = – 92.32 kJ mol–1 r 1 H2(g) + O2(g) → H2O(l) ;2Δ H0 = –285.8 kJ mol–1 r The decrease in enthalpy in passing from reactants to products may be shown for any exothermic reaction on an enthalpy diagram as shown in Fig. 6.10(a). Thus, the postulate that driving force for a chemical reaction may be due to decrease in energy sounds ‘reasonable’ as the basis of evidence so far ! Now let us examine the following reactions: 1 2 N2(g) + O2(g) → NO2(g);H0Δ = +33.2 kJ mol–1 r C(graphite, s) + 2 S(l) → CS2(l); Δ H 0 = +128.5 kJ mol–1 r These reactions though endothermic, are spontaneous. The increase in enthalpy may be represented on an enthalpy diagram as shown in Fig. 6.10(b). Therefore, it becomes obvious that while decrease in enthalpy may be a contributory factor for spontaneity, but it is not true for all cases. (b) Entropy and spontaneity Then, what drives the spontaneous process in a given direction ? Let us examine such a case in which ΔH = 0 i.e., there is no change in enthalpy, but still the process is spontaneous. Let us consider diffusion of two gases into each other in a closed container which is isolated from the surroundings as shown in Fig. 6.11. Fig. 6.11 Diffusion of two gases The two gases, say, gas A and gas B are represented by black dots and white dots respectively and separated by a movable partition [Fig. 6.11 (a)]. When the partition is withdrawn [Fig.6.11( b)], the gases begin to diffuse into each other and after a period of time, diffusion will be complete. Let us examine the process. Before partition, if we were to pick up the gas molecules from left container, we would be sure that these will be molecules of gas A and similarly if we were to pick up the gas molecules from right container, we would be sure that these will be molecules of gas B. But, if we were to pick up molecules from container when partition is removed, we are not sure whether the molecules picked are of gas A or gas B. We say that the system has become less predictable or more chaotic. We may now formulate another postulate: in an isolated system, there is always a tendency for the systems’ energy to become more disordered or chaotic and this could be a criterion for spontaneous change ! At this point, we introduce another thermodynamic function, entropy denoted as S. The above mentioned disorder is the manifestation of entropy. To form a mental picture, one can think of entropy as a measure of the degree of randomness or disorder in the system. The greater the disorder in an isolated system, the higher is the entropy. As far as a chemical reaction is concerned, this entropy change can be attributed to rearrangement of atoms or ions from one pattern in the reactants to another (in the products). If the structure of the products is very much disordered than that of the reactants, there will be a resultant increase in entropy. The change in entropy accompanying a chemical reaction may be estimated qualitatively by a consideration of the structures of the species taking part in the reaction. Decrease of regularity in structure would mean increase in entropy. For a given substance, the crystalline solid state is the state of lowest entropy (most ordered), The gaseous state is state of highest entropy. Now let us try to quantify entropy. One way to calculate the degree of disorder or chaotic distribution of energy among molecules would be through statistical method which is beyond the scope of this treatment. Other way would be to relate this process to the heat involved in a process which would make entropy a thermodynamic concept. Entropy, like any other thermodynamic property such as internal energy U and enthalpy H is a state function and ΔS is independent of path. Whenever heat is added to the system, it increases molecular motions causing increased randomness in the system. Thus heat (q) has randomising influence on the system. Can we then equate ΔS with q ? Wait ! Experience suggests us that the distribution of heat also depends on the temperature at which heat is added to the system. A system at higher temperature has greater randomness in it than one at lower temperature. Thus, temperature is the measure of average chaotic motion of particles in the system. Heat added to a system at lower temperature causes greater randomness than when the same quantity of heat is added to it at higher temperature. This suggests that the entropy change is inversely proportional to the temperature. ΔS is related with q and T for a reversible reaction as : qΔS = rev	(6.18)T The total entropy change ( ΔS ) for thetotalsystem and surroundings of a spontaneous process is given by ΔS =ΔS +ΔS >0 (6.19)total system surr When a system is in equilibrium, the entropy is maximum, and the change in entropy, ΔS = 0. We can say that entropy for a spontaneous process increases till it reaches maximum and at equilibrium the change in entropy is zero. Since entropy is a state property, we can calculate the change in entropy of a reversible process by qsys revΔS	= ,sysT We find that both for reversible and irreversible expansion for an ideal gas, under isothermal conditions, ΔU = 0, but ΔS i.e.,totalΔS +ΔS is not zero for irreversiblesys surr process. Thus, ΔU does not discriminate between reversible and irreversible process, whereas ΔS does. Problem 6.9 Predict in which of the following, entropy increases/decreases : (i) A liquid crystallizes into a solid. (ii) Temperature of a crystalline solid is raised from 0 K to 115 K. (iii) 2NaHCO (s)→ Na CO (s)+3 23 CO2 g + HOg() 2 () (iv) H2 ( g)→ 2H g() Solution (i) After freezing, the molecules attain an ordered state and therefore, entropy decreases. (ii) At 0 K, the contituent particles are static and entropy is minimum. If temperature is raised to 115 K, these begin to move and oscillate about their equilibrium positions in the lattice and system becomes more disordered, therefore entropy increases. (iii) Reactant, NaHCO is a solid and it 3has low entropy. Among products there are one solid and two gases. Therefore, the products represent a condition of higher entropy. (iv) Here one molecule gives two atoms i.e., number of particles increases leading to more disordered state. Two moles of H atoms have higher entropy than one mole of dihydrogen molecule. Problem 6.10 For oxidation of iron, 4Fe s( )+ 3O ( g)→ 2Fe O (s)2 23 entropy change is – 549.4 JK–1mol–1at 298 K. Inspite of negative entropy change of this reaction, why is the reaction spontaneous? (Δ H 0for this reaction is r –1648 × 103 J mol–1) Solution One decides the spontaneity of a reaction by considering ΔS (ΔSsys +ΔS ) . For calculatingtotal surr ΔS , we have to consider the heat surr absorbed by the surroundings which is equal to –Δ rH 0 . At temperature T, entropy change of the surroundings is Δ HV rΔS =− (at constant pressure)surr T 3 −1(− × J mol )1648 10 =− 298 K 1 −1= 5530 JK− molThus, total entropy change for this reaction (c) Gibbs energy and spontaneity We have seen that for a system, it is the total entropy change, ΔS which decides the totalspontaneity of the process. But most of the chemical reactions fall into the category of either closed systems or open systems. Therefore, for most of the chemical reactions there are changes in both enthalpy and entropy. It is clear from the discussion in previous sections that neither decrease in enthalpy nor increase in entropy alone can determine the direction of spontaneous change for these systems. For this purpose, we define a new thermodynamic function the Gibbs energy or Gibbs function, G, as G = H – TS (6.20) Gibbs function,G is an extensive property and a state function. The change in Gibbs energy for the system, ΔG can be written as sysΔG = ΔH − T ΔS − S ΔT sys sys sys sys At constant temperature, ΔT = 0 ∴Δ G = ΔH − TΔS sys sys sys Usually the subscript ‘system’ is dropped and we simply write this equation as ΔG =ΔH − T ΔS (6.21) Thus, Gibbs energy change = enthalpy change – temperature × entropy change, and is referred to as the Gibbs equation, one of the most important equations in chemistry. Here, we have considered both terms together for spontaneity: energy (in terms of ΔH) and entropy (ΔS, a measure of disorder) as indicated earlier. Dimensionally if we analyse, we find that ΔG has units of energy because, both ΔH and the TΔS are energy terms, since TΔS = (K) (J/K) = J. Now let us consider how ΔG is related to reaction spontaneity. We know, ΔS = ΔS + ΔStotalsyssurrIf the system is in thermal equilibrium with the surrounding, then the temperature of the surrounding is same as that of the system. Also, increase in enthalpy of the surrounding is equal to decrease in the enthalpy of the system. Therefore, entropy change of surroundings, ΔH ΔHsys surr ΔS = =− surr T T ⎛ΔHsys ⎞ΔS =Δ S +⎜−total sys  ⎝T Rearranging the above equation: TΔS = TΔS – ΔHtotalsyssys For spontaneous process, ΔS > 0 , sotot al TΔSsys – ΔHsys > 0 ( H − TΔS )>⇒− Δ 0 sys sys Using equation 6.21, the above equation can be written as −ΔG > 0 ΔG =ΔH − T ΔS< 0 (6.22) ΔH is the enthalpy change of a reaction,sysTΔSsys is the energy which is not available to do useful work. So ΔG is the net energy available to do useful work and is thus a measure of the ‘free energy’. For this reason, it is also known as the free energy of the reaction. ΔG gives a criteria for spontaneity at constant pressure and temperature. (i) If ΔG is negative (< 0), the process is spontaneous. (ii) If ΔG is positive (> 0), the process is non spontaneous. Note : If a reaction has a positive enthalpy change and positive entropy change, it can be spontaneous when TΔS is large enough to outweigh ΔH. This can happen in two ways; (a)The positive entropy change of the system can be ‘small’ in which case T must be large. (b)The positive entropy change of the system can be ’large’, in which case T may be small. The former is one of the reasons why reactions are often carried out at high temperature. Table 6.4 summarises the effect of temperature on spontaneity of reactions. 6.7 GIBBS ENERGY CHANGE AND EQUILIBRIUM We have seen how a knowledge of the sign and magnitude of the free energy change of a chemical reaction allows: (i) Prediction of the spontaneity of the chemical reaction. (ii) Prediction of the useful work that could be extracted from it. So far we have considered free energy changes in irreversible reactions. Let us now examine the free energy changes in reversible reactions. ‘Reversible’ under strict thermodynamic sense is a special way of carrying out a process such that system is at all times in perfect equilibrium with its surroundings. When applied to a chemical reaction, the term ‘reversible’ indicates that a given reaction can proceed in either direction simultaneously, so that a dynamic equilibrium is set up. This means that the reactions in both the directions should proceed with a decrease in free energy, which seems impossible. It is possible only if at equilibrium the free energy of the system is minimum. If it is not, the system would spontaneously change to configuration of lower free energy. So, the criterion for equilibrium A + B ⇌ C + D; is Δ G = 0 r Gibbs energy for a reaction in which all reactants and products are in standard state, Δ rG 0 is related to the equilibrium constant of the reaction as follows:G00 = Δ + RT ln K r or Δ G 0 = – RT ln K r or Δ G0 = – 2.303 RT log K (6.23)r We also know that VV VΔ G = Δ H − TΔ S =− RT ln K (6.24)rr r For strongly endothermic reactions, the value of Δ rH0 may be large and positive. In such a case, value of K will be much smaller than 1 and the reaction is unlikely to form much product. In case of exothermic reactions, Δ H0 is large and negative, andΔ G0 is likely tor	r be large and negative too. In such cases, K will be much larger than 1. We may expect strongly exothermic reactions to have a large K, and hence can go to near completion. Δ rG 0 also depends upon Δ S0 , if the changes in ther entropy of reaction is also taken into account, the value of K or extent of chemical reaction will also be affected, depending upon whether Δ rS 0 is positive or negative. Table 6.4 Effect of Temperature on Spontaneity of Reactions Δ r H 0 Δ r S 0 Δ r G 0 Description* – – – + + + + – – + + – – – (at low T ) + (at high T ) + (at low T ) – (at high T ) + (at all T ) Reaction spontaneous at all temperature Reaction spontaneous at low temperature Reaction nonspontaneous at high temperature Reaction nonspontaneous at low temperature Reaction spontaneous at high temperature Reaction nonspontaneous at all temperatures * The term low temperature and high temperature are relative. For a particular reaction, high temperature could even mean room temperature. Using equation (6.24), (i) It is possible to obtain an estimate of ΔGV from the measurement of ΔHV and ΔSV , and then calculate K at any temperature for economic yields of the products. (ii) If K is measured directly in the laboratory, value of ΔG0 at any other temperature can be calculated. Problem 6.11 Calculate Δ G 0 for conversion of oxygenr to ozone, 3/2 O(g) → O (g) at 298 K. if K 23	p for this conversion is 2.47 × 10–29. Solution We know Δ rG0 = – 2.303 RT log Kp and R = 8.314 JK–1 mol–1 Therefore, Δ G0 = r – 2.303 (8.314 J K–1 mol–1) × (298 K) (log 2.47 × 10–29) = 163000 J mol–1 = 163 kJ mol–1. Problem 6.12 Find out the value of equilibrium constant for the following reaction at 298 K. 3 + CO 22NH ( g) 2 ( g) ⇌ NH CONH 2 (aq ). HO l Standard Gibbs energy change, Δ G0 at + 2 () r the given temperature is –13.6 kJ mol–1. Solution –Δ G V We know, log K = r2.303 RT 3 –1( –13.6 × 10 Jmol ) –1 –12.303 8.314 JK mol 298K = 2.38 Hence K = antilog 2.38 = 2.4 × 102. = ( )() Problem 6.13 At 60°C, dinitrogen tetroxide is fifty percent dissociated. Calculate the standard free energy change at this temperature and at one atmosphere. Solution NO ⇀(g)(g) 2NO 24↽2If N2O4 is 50% dissociated, the mole fraction of both the substances is given by 1 − 0.5 2 × 0.5 x 24= ; x = N O NO21 +0.5 1 + 0.5 0.5 p	pN2O4 = × 1 atm, NO2 = 1.5 1 × 1 atm. 1.5 The equilibrium constant K is given byp( pNO )2 1.5 Kp = 2 = 2 pN O (1.5) (0.5) 24 = 1.33 atm. Since Δ G0 = –RT ln K rp G0Δ = (– 8.314 JK–1 mol–1) × (333 K)r × (2.303) × (0.1239) = – 763.8 kJ mol–1 SUMMARY 6.1 Choose the correct answer. A thermodynamic state function is a quantity (i) used to determine heat changes (ii) whose value is independent of path (iii) used to determine pressure volume work (iv) whose value depends on temperature only. 6.2 For the process to occur under adiabatic conditions, the correct condition is: (i) ΔT = 0 (ii) Δp = 0 (iii) q = 0 (iv) w = 0 6.3 The enthalpies of all elements in their standard states are: (i) unity (ii) zero (iii) < 0 (iv) different for each element 6.4 ΔU0 of combustion of methane is – X kJ mol–1. The value of ΔH0 is (i) = ΔU0 (ii) > ΔU0 (iii) < ΔU0 (iv) = 0 6.5 The enthalpy of combustion of methane, graphite and dihydrogen at 298 K are, –890.3 kJ mol–1 –393.5 kJ mol–1, and –285.8 kJ mol–1 respectively. Enthalpy of formation of CH(g) will be4(i) –74.8 kJ mol–1 (ii) –52.27 kJ mol–1 (iii) +74.8 kJ mol–1 (iv) +52.26 kJ mol–1. 6.6 A reaction, A + B → C + D + q is found to have a positive entropy change. The reaction will be (i) possible at high temperature (ii) possible only at low temperature (iii) not possible at any temperature (v) possible at any temperature 6.7 In a process, 701 J of heat is absorbed by a system and 394 J of work is done by the system. What is the change in internal energy for the process? 6.8 The reaction of cyanamide, NH2CN (s), with dioxygen was carried out in a bomb calorimeter, and ΔU was found to be –742.7 kJ mol–1 at 298 K. Calculate enthalpy change for the reaction at 298 K. 3 NHCN(g) + O(g) → N(g) + CO(g) + HO(l)222222 6.9 Calculate the number of kJ of heat necessary to raise the temperature of 60.0 g of aluminium from 35°C to 55°C. Molar heat capacity of Al is 24 J mol–1.K–1 6.10 Calculate the enthalpy change on freezing of 1.0 mol of water at10.0°C to ice at –10.0°C. ΔfusH = 6.03 kJ mol–1 at 0°C. Cp [H2O(l)] = 75.3 J mol–1 K–1 Cp [H2O(s)] = 36.8 J mol–1 K–1 6.11 Enthalpy of combustion of carbon to CO2 is –393.5 kJ mol–1. Calculate the heat released upon formation of 35.2 g of CO2 from carbon and dioxygen gas. 6.12 Enthalpies of formation of CO(g), CO(g), NO(g) and NO (g) are –110,2224– 393, 81 and 9.7 kJ mol–1 respectively. Find the value of Δ rH for the reaction: N2O4(g) + 3CO(g) → N2O(g) + 3CO2(g) 6.13 Given N (g) + 3H(g) → 2NH (g) ; Δ H0 = –92.4 kJ mol–1 223r What is the standard enthalpy of formation of NH3 gas? 6.14 Calculate the standard enthalpy of formation of CH3OH(l) from the following data: CHOH (l) + 3 O(g) → CO(g) + 2HO(l) ; Δ H0 = –726 kJ mol–1 3222r2C(graphite) + O2(g) → CO2(g) ; Δ cH0 = –393 kJ mol–1 H(g) + 1 O(g) → HO(l) ; ΔH0 = –286 kJ mol–1.2222f 6.15 Calculate the enthalpy change for the process CCl4(g) → C(g) + 4 Cl(g) and calculate bond enthalpy of C – Cl in CCl4(g). Δ H0(CCl) = 30.5 kJ mol–1. vap 4ΔfH0 (CCl4) = –135.5 kJ mol–1. Δ aH0 (C) = 715.0 kJ mol–1 , where Δ aH0 is enthalpy of atomisation Δ aH0 (Cl2) = 242 kJ mol–1 6.16 For an isolated system, ΔU = 0, what will be ΔS ? 6.17 For the reaction at 298 K, 2A + B → C ΔH = 400 kJ mol–1 and ΔS = 0.2 kJ K–1 mol–1 At what temperature will the reaction become spontaneous considering ΔH and ΔS to be constant over the temperature range. 6.18 For the reaction, 2 Cl(g) → Cl2(g), what are the signs of ΔH and ΔS ? 6.19 For the reaction 2 A(g) + B(g) → 2D(g) ΔU 0 = –10.5 kJ and ΔS0 = –44.1 JK–1. Calculate ΔG0 for the reaction, and predict whether the reaction may occur spontaneously. 6.20 The equilibrium constant for a reaction is 10. What will be the value of ΔG0 ? R = 8.314 JK–1 mol–1, T = 300 K. 6.21 Comment on the thermodynamic stability of NO(g), given 11 0N2(g) + O2(g) → NO(g) ; Δ rH = 90 kJ mol–1 22 NO(g) + 1O(g) → NO(g) : Δ H0= –74 kJ mol–1 222r 6.22 Calculate the entropy change in surroundings when 1.00 mol of H2O(l) is formed under standard conditions. Δf H0 = –286 kJ mol–1.